A copy of a letter from Attorney General William Barr advising Congress of the findings of the Mueller probe. US ATTORNEY GENERAL Bill Barr released a summary last night of Special Counsel Robert Mueller’s long-awaited report into allegations that Donald Trump’s campaign colluded with Russia in the 2016 presidential election. Over the course of the two-year investigation the president regularly denounced it as a witch hunt, before claiming vindication upon its completion. While the US President is claiming “total exoneration”, Democrats are highlighting elements of the summary which specifically do not exonerate Trump. In a letter to lawmakers, Barr said that Mueller found that there had been “multiple offers from Russian-affiliated individuals to assist the Trump campaign”. It was found that there were two main Russian efforts to influence the 2016 election. Barr said: “The first involved attempts by a Russian organization, the Internet Research Agency, to conduct disinformation and social media operations in the United States designed to sow social discord, eventually with the aim of interfering with the election. “The second element involved the Russian government’s efforts to conduct computer hacking operations designed to gather and disseminate information to influence the election. But quoting directly from Mueller’s report, Barr said that the special counsel’s investigation “did not establish that members of the Trump campaign conspired or coordinated with the Russian government in its election interference activities”. But Barr said that the evidence outlined in Mueller’s report “is not sufficient to establish that the President committed an obstruction-of-justice offence”. But while Barr – who was appointed by Trump – concluded that the president had not obstructed justice, he acknowledged that Mueller himself was inconclusive on the question of obstruction. “The Special Counsel therefore did not draw a conclusion – one way or another – as to whether the examined conduct constituted obstruction,” he said. Barr added that Mueller “recognised that the ‘evidence does not establish that the president was involved in an underlying crime related to Russian election interference,’ and that, while not determinative, the absence of such evidence bears upon the president’s intent with respect to obstruction”. 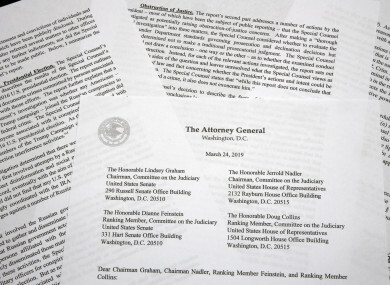 The immediate reaction from Democrats was to call for the publication of the full Mueller report, after Barr released his four-page summary last night. But with the report declining to determine whether there was obstruction of justice by the president, House Speaker Nancy Pelosi and Senate Minority Leader Chuck Schumer escalated their demands for the full document’s release. “The fact that Special Counsel Mueller’s report does not exonerate the president on a charge as serious as obstruction of justice demonstrates how urgent it is that the full report and underlying documentation be made public without any further delay,” the Democratic pair said in a joint statement. They also said Barr, nominated just months ago by Trump, is “not a neutral observer” in the process and that his summary of the report is not an objective determination about Mueller’s findings. Other senior Democrats, such as presidential candidate Bernie Sanders, called for the full report. “I don’t want a summary of the Mueller report. I want the whole damn report,” he said. Email “Explainer: Here are the key findings of the Mueller report into Russian collusion”. Feedback on “Explainer: Here are the key findings of the Mueller report into Russian collusion”.